Normally I take a couple of CDs off my shelves at random when I'm writing my posts. I don't like to consign music to the background, and I admit it is often extremely difficult to concentrate on writing when music is playing, but it gives me a chance to bring out some of the thousands of CDs which normally don't get an airing unless I am writing specifically about them. Sometimes I come up with real wonders - and sometimes plain dross. It struck me as a nice chance to share some thoughts on CDs which I possess - not in the nature of reviews but short comments which might bring to attention CDs which may have passed other people by. After all, record review magazines only generally look at new releases or re-issues, so here's a chance for me to blow the dust off discs which may have past their first flush of youth. Many, of course, have long been deleted from the catalogues, but I can send details if anyone is wanting to know more. 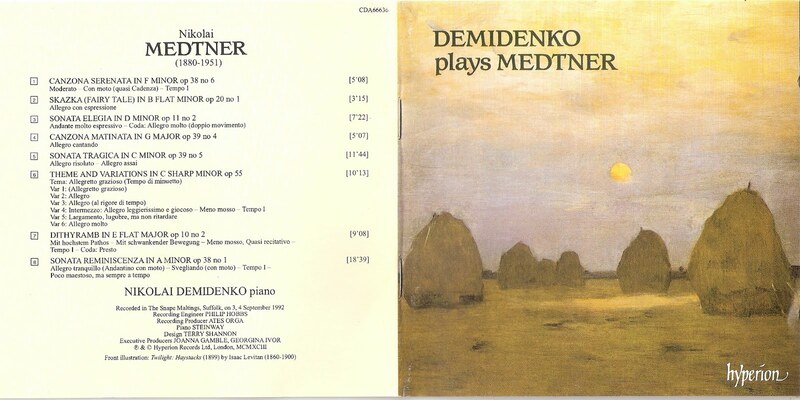 Today, for example I have been listening to Nikolai Demidenko play Medtner piano music on a Hyperion disc (CDA66636) released in 1993. It is one of the most enchanting discs of piano CDs I've heard for a while, the music is lovely and Demidenko catches perfectly that nice feeling of warm musical integrity which distinguishes Medtner from so many other pianist/composers. I'm particularly taken by the Canzona Serenata. A lovely disc in every respect. I had forgotten all about the disc of Bach Christmas Cantatas (Berlin Classics 0149262BC) I had been sent for review back in 2007. It is a compilation made from recordings dating from 1981, 1982 and 1984 by the choir of St Thomas's Church Leipzig. It sometimes sounds as if the microphones have been wrapped in thick wool to keep out the cold (look at the cover - doesn't that just make you shiver? ), but I was brought up short by an absolutely enchanting duet between Arleen Auger and an astonishingly kazoo-sounding oboe d'amore in the aria "Ein irdscher Glanz" from BWV1. This is so lovely, even the dated recording can't obscure what is utterly enchanting music making. It's a shame the other soloists tend to make such heavy weather of it all and that the chorus is all a bit strained, but I do enjoy the bouyancy Hans-Joachim Rotzsch injects into his players. Sullivan's Boer War Te Deum? I've never heard of it. A must get, I'd have thought, although is it right that in these days of peace and love between all races and religions (!) we recall such a divisive time in European involvement in Africa. On an unrelated matter, but concerning your passing reference to the current situation in London, it must be all the smoke about, but the images we see on television here of the London Looters and Lighters seems to indicate that all of them have smoke-blackened faces! I'll present you with a copy of Sir Arthur Sullivan's 'Boer War' Te Deum when we meet in what's left of London in a few weeks' time.